Also, for my customers both new an old, please note that I've switched my email address to commissions@grinnialvex.com as that's been a sorely needed move that I've taken far too long to make. I was just using an old personal account before, and inquiries have been missed because of it. This change will allow me to keep things focused and tidy, which means speedier responses. It's been more than a month since my last blog post. I feel like I need to keep up with this better in order to show visitors that I'm around and active, but I also feel like if I have time to sit down and write a blog post then I have time to sit down and paint. I'd rather do the latter, lol. Anyway, anyone picking up February's issue of White Dwarf (and why aren't you, because the current iteration of White Dwarf is badass!) 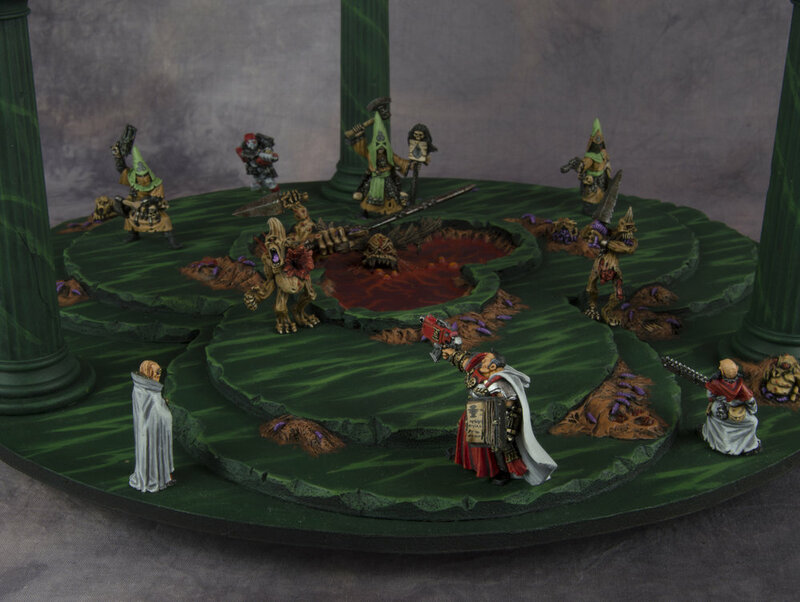 can see one of my models in there towards the back, and that's a damned good reason to sit down and mash a few words together! I'm crazy proud of that, even if the pic itself is a bit dark and muddy on the page. Seeing your work published in print like this is one of the coolest feelings this hobby has to offer, and these days it's pretty much as easy as taking a good picture of a cool model and shooting it over to the White Dwarf team. Once upon a time, however, getting your pic in a Games Workshop publication require more herculean efforts. A few years ago, I managed to get my converted Ghazzy model in the second issue of Warhammer Visions as he earned an honorable mention in the Memphis Golden Daemon awards! Yeah... that's clearly not a Meganob model, lol. The pic doesn't mention at all that this was an honorable mention, and was published along with a bunch of the winners. Also, my son took bronze in the Youngbloods category that year and his pic never even got published. I'm still a bit sore about that as he definitely earned it. Going back even further, to the glory days of goblin green bases, mail-order bitz, dial-up internet, and a time when painters jealously guarded their secrets instead of filming themselves doing EVERYTHING for YouTube, I found myself in White Dwarf #285 as a gold winner in the 2003 Baltimore Golden Daemon! Holy crapballs, how awesome is that! Not only did I take gold, but I somehow managed to beat two incredibly badass Slayer Sword winners. I can still remember Jeff congratulating me, and Robin Dews handing me that trophy. I spent a solid three months planning and building that diorama, and another three months painting everything, all the while working on a two-foot wide roll-top desk that was shoehorned into a tiny closet. I watched the Golden Daemon judging at the Chicago Games Day the year prior, and painfully watched as one of my models got cut from the from the final group of four with a dismissive hand-wave from a judge, so I spent those six months hell-bent on not just breaking the top three but hitting the very top! I knew I had what it took, but I knew there was no way I could actually watch the judging again, lol. Wait, where'd all the time go? Anyway, I'll add pics of some of December's models to the galleries soon, so be on the lookout for that. Nurgle Daemon Gallery is Live! Recently, I finished a small force of Nurgle Daemons for Armies on Parade and took gold at my local GW store. I'm planning on creating a gallery for them here soon, but have a few details I'd like to tidy on them before I set about taking proper pictures of them. One of the models, my Great Unclean One, was converted extensively and I've had a few requests to show how that all happened. Fortunately, I try to take lots of progress pictures when I'm working, so I'll put those all together, tutorial-style, in a future blog post. In the meantime, I've added another half-dozen or so pics to the 40k orks gallery. More of those to come in the future as well!